SOMERVILLE—The mood of the room defied the typical political event. Martha Coakely sat at the far end of a circle of tables and chairs, each seat filled by a woman, a mom, in fact. Each was talking about the struggles with addiction their children and grandchildren experienced and how, as providers, they, too, dealt with the impact. The circle, set in a large bright room in the back of Connexion, a faith-based community center here, took on an intimacy that removed itself form the outer circle of onlookers—reporters and campaign staff—who, seeming out the participants’ minds, might as well have been in Rhode Island. “You can’t get into a treatment program unless junk is in your system then,” one woman said. Events like this have multifold value for Coakley, not the least of which is her own emphasis on the broader question of mental health in light of her brother’s suicide years ago. Groups like this will not win the Democratic primary for governor. However, they offer a venue to learn more about the needs of the people she seeks to serve and overcome the reputation of disconnect haunting Coakley since the 2010 special senate election. Polls have tightened in the Democratic primary over the last few weeks as Treasurer Steve Grossman has gone on the air. The punditocracy still largely, though by no means exclusively, predicts Coakley will win. Don Berwick, the former head of the Centers for Medicare and Medicaid, while currently polling third, has positioned himself as the more progressive candidate in the race. Coakley, by no means a conservative, has somewhat allowed herself to be pegged as such. Her campaign has not been without definition, but she and her Democratic opponents have struggled to step out from behind the popular Democratic incumbent, Deval Patrick. Once the party is reunified after the primary, this problem may yet subside. Republicans have apparently decided Coakley will be the nominee and have been firing political rounds at her all summer. However, save for one recent poll, Coakley has also consistently outpolled likely Republican nominee Charlie Baker. Remembering the 2010 race, some commentators have suggested that Baker’s sudden cultivation of a personality will, in the end, doom Coakley. But that is why these events and other like them across the commonwealth are all the more important. House parties in Holyoke, opening her election office in Springfield and a lot of canvassing are all part of it. The Service Employees International Union is spending big on Coakley’s behalf as are other labor unions and EMILY’s list. Baker has run an issue-lite campaign, content to simply argue the commonwealth needs a manager like himself. However, in a recent interview Coakley did not appear at all troubled by Baker playing that card. “I am really happy to have people look as my being a manger,” she told WMassP&I after her Springfield campaign headquarters open in July. Coakley noted the AG office’s success both in the execution of its duties and in attracting and retaining talent in the office. Indeed as a manager, despite Baker’s pitch may not knock down Coakley easily. Pundits, activists and political navel-gazers have criticized the attorney general for an unambitious platform. But when asked about her record as the state’s chief law enforcement officer, Coakley defends it effectively, with both barrels blazing. Despite criticism of aspects of her record, her opponents’ attempts to hit that record have probably done less to shift the race than the contrasts in tone and platform among the candidates. Nor has the difficulty of rising from a prosecutorial role to one like chief executive bothered Coakley much. Some has said, jokingly, AG means to “awaiting governor” because the office’s profile is a great way to build a gubernatorial campaign . Attorneys general in Massachusetts have had much less success in this regard. Since 1974, every attorney general except James Shannon has run for governor and lost. Scott Harshbarger came closest, winning the nomination, but losing to acting Governor Paul Cellucci. Other prosecutors have suffered a loss of political stock in recent years. At one time, US Attorney Carmen Ortiz was seen as a potential political figure (something at which Coakley expressed some bemusement), but talk of that has died down. Suffolk County District Attorney Daniel Conley’s bid for mayor ended in fourth place at the city’s preliminary. “There are a lot of reasons why one person wins that may or may not be applicable,” Coakley said. What was applicable, she argued, was the experience she cultivated as attorney general. She noted a number of issues confronted in her tenure, most notably, the actions of Wall Street leading up the recession. However, she described how as AG and before that Middlesex District Attorney, she saw the failure of the commonwealth’s drug laws and a system incarcerating addicts and the mentally ill.
“I’ve been working in public safety for 25 years now. I’ve seen these very sad cases,” she told WMassP&I in Somerville. “We have a criminal justice system, as well-meaning as it is, does not have the resources or the expertise,” she continued, referring to addressing mental health and addiction. Coakley has hardly been a stranger in Western Mass. She grew up in North Adams and has made several political stops in the region this campaign season. The support of figures like Alex Morse, whose own campaigns have made an art of scooping up votes via the grassroots, can be invaluable to Martha Coakley’s campaign. Although several top politicos were scooped up (mostly by Grossman), she has nevertheless built up a stable of support from politicos old and young. Among the standout endorsements she has received with the potential to make a difference include former Rep. Ben Swan, Ludlow School Committee member Jake Oliveira and Holyoke Mayor Alex Morse. All of her supporters have their own reasons for supporting her. Some tie directly to her work as attorney general. In the release announcing her support of Coakley, Springfield Ward 1 City Councilor Zaida Luna noted “our shared belief of the importance of listening to, and caring about, the needs of the people of Springfield.” At Coakley’s office opening, Luna also cited Coakley’s commitment to families. However, more than that, Coakley’s office has zeroed on several issues like wage theft and civil rights, which are critical in Luna’s largely poor and heavily minority ward. In terms of Western Mass policy, Coakley principally focuses on the economy, which her Democratic opponents do in their own ways as well. Combining transportation and climate policy, Coakley discussed encouraging smart growth in the 413’s struggling cities, which encourages communities where individuals and families can live, work, and play without total reliance on an automobile. Transportation to better connect the commonwealth east and west, north and south could aid in this endeavor. Coakley did recently unveil a proposal to invest in the infrastructure of the state’s regions that lag economically. Modeled after Gov. Patrick’s life sciences initiative, it would make $500 million available, $400 million of it for infrastructure, and function as a competitive grant, encouraging innovation and collaboration among local officials. 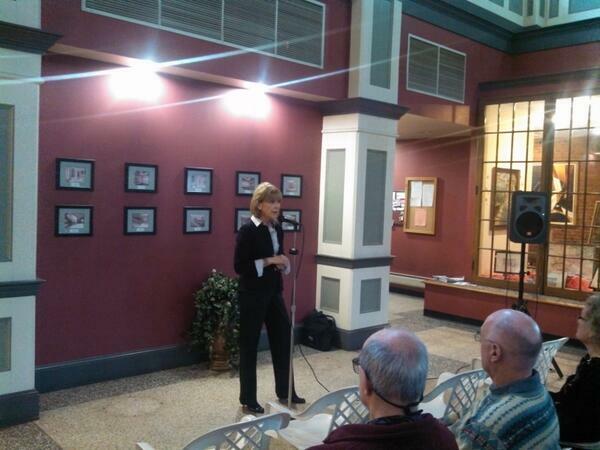 Back in February, she pushed the arts at a meet and greet at Classical Condominiums. “How do we align that growth, create sustainable growth,” elsewhere Coakley added, noting that such lifestyles already exist in Amherst and Northampton. Around the time of her interview with WMassP&I, a deadly fire had swept through a Lowell apartment building, killing 7. It came not long after The Boston Globe’s chilling series on unsafe, often illegal and sometimes deadly housing conditions of apartments rented by Boston students. Locally, the decrepit conditions of several Springfield apartments have also made news. Coakley responded by noting that these circumstances call attention to the aging housing stock, particularly in Boston and Gateway Cities like Lowell and Springfield and the laws that regulate landlords. At the same time, she noted that the fall in property values undercut municipalities’ ability to properly staff its fire departments (a chronic problem in Springfield notably). “It is a big issue of mine,” she said of fire department staffing as well as other agencies like the medical examiner’s office, which must sift through the evidence after the fact, too. When pressed as to how to fund better staffing, Coakley indicated that more money would be available as the economy improved. At the Moms for Martha event in Somerville, though, Coakley seemed in her element. Addiction, a subset of mental health, probably qualifies as her marquee issue and the women in the room were bearing their souls to the attorney general. Although she chimed in from time to time to discuss her brother’s suicide, mostly the other women spoke. Gone—here at least—was the candidate of 2010 punchlines. On display, instead, was the human touch many pols have, but often hide under the bushel of their public persona. Occasionally, she added some thoughts about what the women were saying. After the mother described how she practically had to buy her son drugs just to get him admitted to a program, Coakley said her administration would see to it that admission rules change. She nodded when another mom decried the prison-industrial complex, although Coakley did note the commonwealth’s prison structure lacked the same such incentives as other states.